On November 10, 2011, the eve of Remembrance Day, the Kindred Credit Union - which was then called Mennonite Savings and Credit Union - and Conrad Grebel University College announced the creation of the Centre for Peace Advancement (CPA) at Conrad Grebel. The credit union’s $1 million dollar transformative gift was subsequently matched by additional donations totaling $500,000, and created the opportunity to add an entire fourth floor as part of Grebel’s Next Chapter campaign. 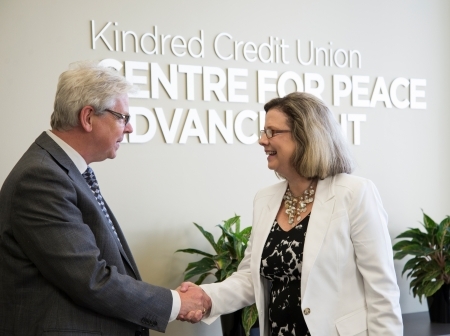 The Kindred Credit Union Centre for Peace Advancement celebrated its official opening in September of 2014. In the years between 2011 and its opening, much work was put into the Centre's development, from building the physical space and beyond. The work of a CPA task force and, following that, a CPA advisory committee, drove early developments. A working position statement was developed in consultation with the College's board, Council, and the credit union. Throughout this process, feedback was solicited from 42 peace researchers and advocates in the community. In September in 2014, before the CPA's official launch, Paul Heidebrecht was hired as the inaugural director. Two months later, in November, Michelle Jackett was hired as coordinator. If you visit the Kindred Credit Union Centre for Peace Advancement today, you'll find a vibrant community of peace scholars and practitioners. Learn more about the CPA and who is involved.